Get away from the glitz and pavements of Las Vegas and get ready to ride the trails of the McCullough Mountain Range, Hidden Valley, and the Roach Dry Lakebed. This no-experience-required all-terrain vehicle (ATV) adventure tour takes you into the Hidden Valley. Just a short ride from the Strip, this is the longest ATV tour in Las Vegas. 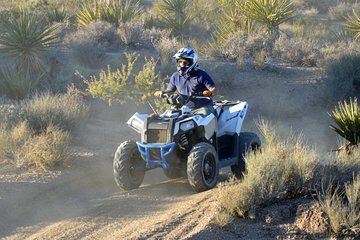 Ride an ATV in Las Vegas! Longest ATV tour in Las Vegas and the shortest ride to get there! Begin with a pickup from your hotel and travel to the tour departure point in Jean, roughly 30 minutes from the Las Vegas Strip. On arrival, receive a comprehensive safety briefing, then set out to explore the rugged desert and mountain terrain. Ride through Hidden Valley to McCullough Moutain Range, passing extinct lava beds and Roach Dry Lakebed on the way. Morning tours offer a brief stop at Buffalo Bill’s Hotel and Casino on the California border before your return ride back to Jean. If afternoons are more your style, you’ll get the same ATV experience without the stop in Primm, shortening the total tour time. After a day exploring this impressive mountain and desert territory, relax on the comfortable, air-conditioned return ride to your Las Vegas hotel. Clothing: Pants or shorts are acceptable for riding. Summer months may be vary hot so please dress accordingly. Please Note: All ATV riders must be at least 16 years old. My wife and I enjoy riding ATV's, and this tour did not disappoint. Great tour, guide/staff were top notch. If your looking for a ATV trip, this is the one. This was worth every penny. We did the atvs and Casey was our guide. But let me tell you that the experience starts as soon as they pick you up from your hotel. Casey gave us history about vegas and had us laughing the whole way there. You end up in the middle of nowhere where you meet the other guides and other people riding. You get split into groups depending on what you are riding. Safety is number one for them and they make sure you are comfortable before getting on the trails(which is good for first -timers like us). We took the first tour in the morning(which is way better IMO, less heat longer rides) You make some scenery stops. The guides will even snap some photos for you! We stopped for a quick lunch at the outlet mall. (there is only like 3 options) Get ready to just be a dusty, sandy mess by the end(they have some cold baby wipes for you at the end). Casey got lucky with just us two and we definitely got lucky with him. He was patient and allowed us to go our own speed(we were definitely slower in the beginning) he made sure we were hydrated and definitely made sure we had fun. I would recommend this to everyone and next time I'm in the area I would do this again! We had a great time, Casey and Tyrone were a lot of fun and we loved the desert. It was a great way to experience the desert. Dirty, nasty and Fast. Great Fun!!! Had an amazing time atving thru the desert in las vegas nevada. Informative, educational and entertaining. A bit of a workout too...lol. Going back in 10 weeks to do it all again with my husband. This was amazing! Everyone was so incredibly nice! I highly recommend this! My 22 yr old daughter and I went on this ATV tour on Oct 27th - while we were in Vegas for the NHRA races. Although my daughter was skeptical re: the tour classification she is bit of a free spirit and was hoping to be let loose on the ATVs! - she was pleasantly surprised and we both had a great time! Of course - the best part is getting to run 55 mph across the flats: Bottom line, all went 100 according to plan. Pick up was on time at the designated hotel. Easy drive in the van to the valley. Quick and thorough instructions. Then onto the AVTs for about 3 hours stop for lunch at the mall just over the CA border included in that time. All the guides on the tour were just terrific! You won't go wrong with this shift off the strip in Vegas!